The river tern (Sterna aurantia) belongs to the family of gulls and terns, the Laridae. The river tern species is distributed in Pakistan, India, Nepal, Bhutan, Bangladesh, Myanmar, Thailand, Cambodia, Laos, Vietnam and China. These tern species are listed as 'Near Threatened' by IUCN. These terns are monotypic species. The river tern (Sterna aurantia) is a medium-sized tern, measuring 35 to 45 cm in length. The wingspan is 80 to 85 cm. The overall plumage of the river tern is gray and white. The upperparts are darkish gray. The underparts and underwings are whitish. The breeders have black cap, merging with the black mask over the eyes. The cap extends to the nape. The wings are long and pointed. The forked tail has long flexible streamers. In wintering birds, the cap is pale gray with black streaks. The juveniles are grayish brown. The bill is stout and yellow. Non-breeding birds have black tip to the yellow bill. The irises are blackish. The legs and feet are red. The call of these tern species is a loud rich "kyeeer ..kyeeer" or "kree ..kree" or high "kiuck" sound. The river tern are distributed in Pakistan, India, Nepal, Bhutan, Bangladesh, Myanmar, Thailand, Cambodia, Laos, Vietnam and China. Vagrant birds have been observed in Iran and Afghanistan. In India, except for the western Rajasthan, these species are distributed in all the states. The Important Bird and Biodiversity Areas (IBA) of these tern species in Pakistan are Indus Dolphin Reserve and Kandhkot wetlands. These tern species do not normally occur in forests. They normally occur in altitudes from 0 to 600 meters. The natural ecosystems and habitats of these species include, freshwater Lakes, streams and creeks. Sometimes found on intertidal mudflats, marshes, lagoons and estuaries. The diet of this river tern consists mainly of fish. Crustaceans, frogs, tadpoles and aquatic insects are their primary food. These species feed by plunge-diving. The breeding season of these river tern species is from February to May in most their breeding grounds. They breed in colonies and are monogamous and territorial. The nesting sites of the river terns are located in less accessible areas such as sandbanks and sand islands in streams and water bodies. The nest is a shallow scrape on dry open ground or in the cover of grass. The nesting sites are prone to flooding. The clutch contains two to three pale buff colored eggs with dark blotches. Both the parents incubate the eggs and raise the young. These river tern species are mostly non-migrant resident birds. They disperse locally after breeding. The populations in higher altitudes descend to the lower levels in winter. Post breeding, the juveniles may disperse and establish in new locations within the range. Within their range they may make local movements for feeding and breeding. The global population size of the river tern (Sterna aurantia) is estimated at 50,000 to 100,000 individual birds. The overall population trend of the species is considered to be declining. In most of its range, this tern species is reported to be uncommon to rare. The generation length is 10.1 years. Its distribution size is about 9,730,000 sq.km. Habitat alteration and destruction, construction of dams, draining of wetlands and human disturbances are the main threats that are endangering the survival of these tern species. 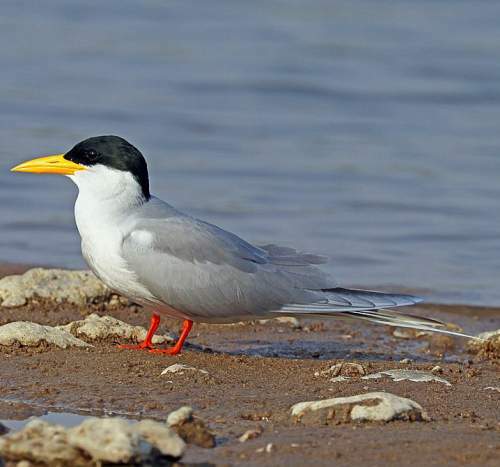 The river tern (Sterna aurantia) is approaching the thresholds for being Vulnerable, under the range size criterion, under the population trend criterion and under the population size criterion. 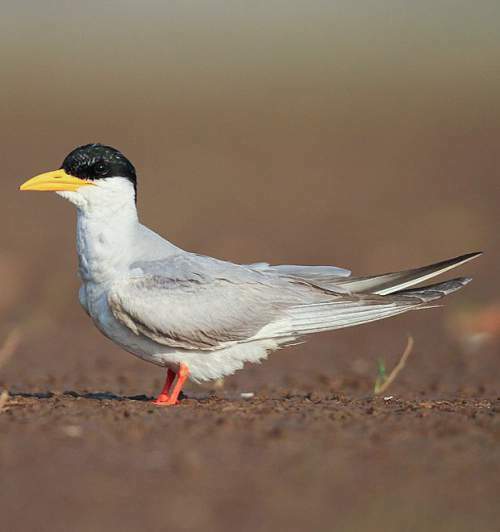 The IUCN (International Union for Conservation of Nature) has categorized and evaluated the tern species and has listed it as "Near Threatened". 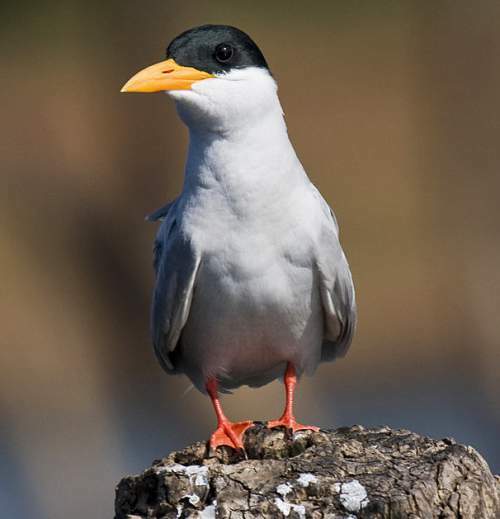 The CITES (Convention on International Trade in Endangered Species of Wild Fauna and Flora) status is ‘Not Evaluated’ for river tern (Sterna aurantia). The river tern (Sterna aurantia) is monotypic species. Current topic in Birds of India: River tern - Sterna aurantia.